New Databases: Delaware, LaGrange, and LaPorte Counties - and More! The newest set of databases on the IGS website includes college graduates, common school students, and Civil War soldiers. Check out these new additions to the IGS website. Note: All of these are members-only databases. IGS members can log in to use them. Not a member? Join today and get access to these and more than 2,000 other databases, plus other member benefits. A list of graduates, as published in the school's August 1943 bulletin. This database includes the student's name, hometown, and the degree they received. A list of graduates, as published in the school's June 4, 1939 commencement program. This database includes the student's name, hometown, and the degree they received. A list of graduates, as published in a June 1939 newspaper article. This database contains the student's name, hometown, and the degree they received. NOTE: Tri-State College later changed its name to Trine University. A list of students in grades 1 through 8, as published in a school souvenir for the 1898-1899 school year. NOTE: Beech Grove School was District No. 4 in Harrison Township. The following are handwritten lists of men who joined various Indiana Legion companies in LaGrange County. The Indiana Legion was the state militia that was created during the Civil War to protect Indiana's borders. Membership was open to every able-bodied male in the state who was not already serving in the military. 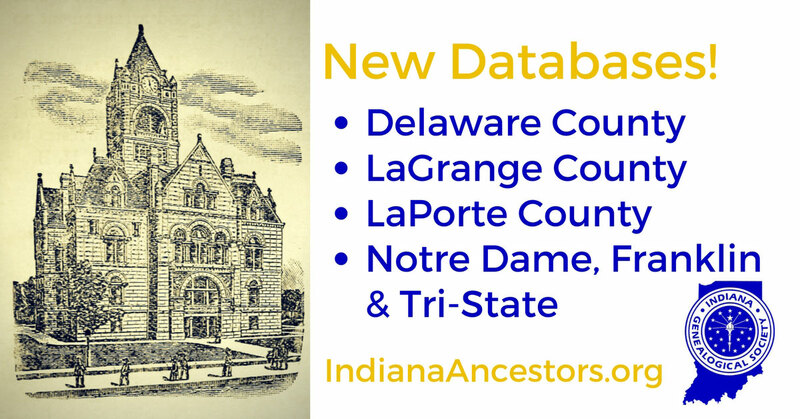 The following are handwritten lists of men who joined various Indiana Legion companies in LaPorte County. The Indiana Legion was the state militia that was created during the Civil War to protect Indiana's borders. Membership was open to every able-bodied male in the state who was not already serving in the military. 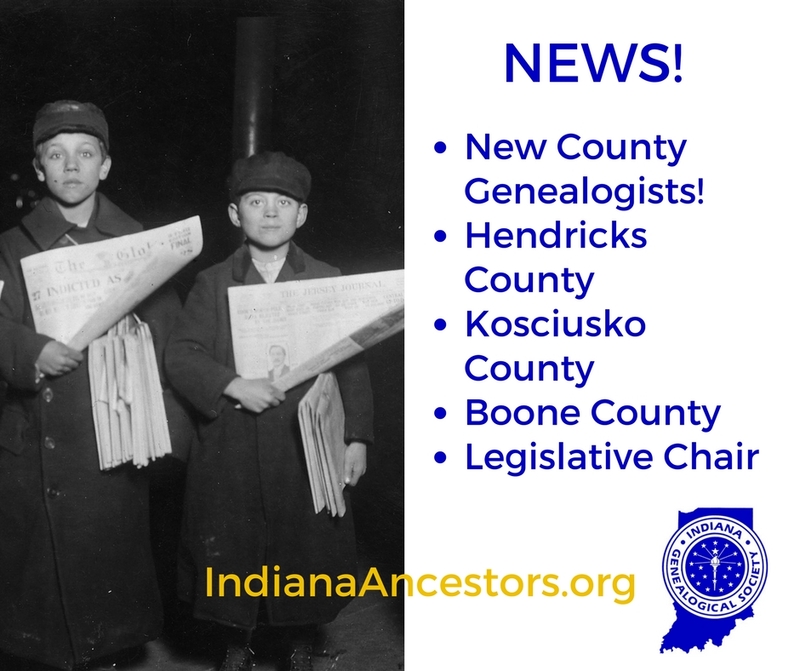 The Indiana Genealogical Society is pleased to announce the appointment of three new Indiana County Genealogists and a new chair for the Legislative Committee. Indiana County Genealogists (ICGs) act as a liaison between the IGS District Director representing that area and the local societies and individuals in that county. 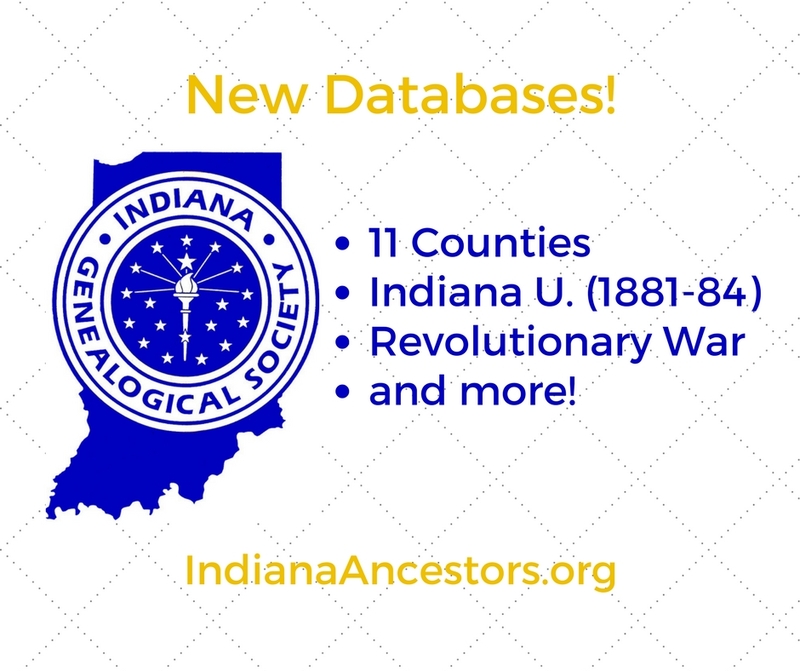 The Legislative Chair works to monitor legislation in Indiana that can impact the genealogical community. Steve Smith is currently working at the Danville Public Library in the Genealogy Department helping patrons with their family history in Hendricks County. He has worked with the Hendricks County Heritage Project contained on the Indiana Memory website. Steve is not only a member of several genealogical and historical societies, he also belongs to the Association of Professional Genealogists. Peggy Biltz is a volunteer with the Kosciusko Historical Society. She has been doing research for over 30 years, and helping others for more than four years. 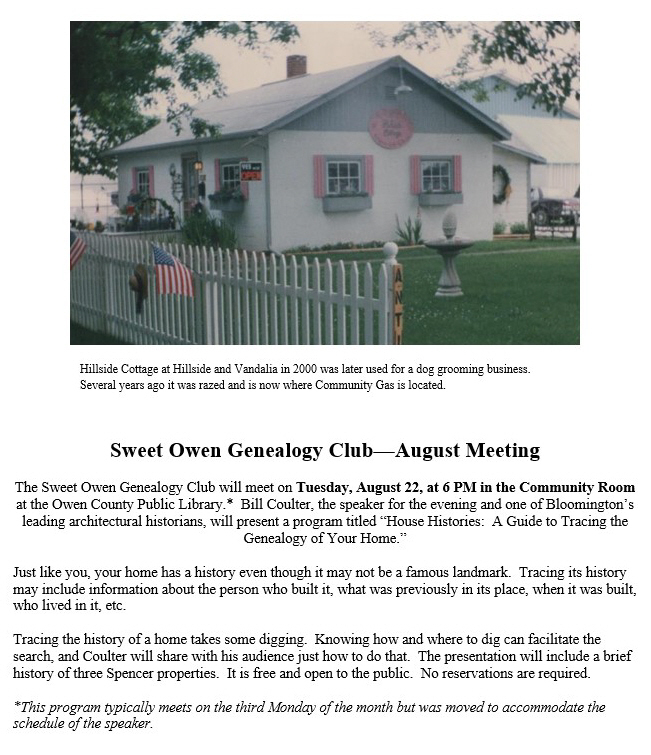 Tersea is currently the President of the Boone County Genealogical Society, she has a enormous amount of knowledge of the records in the Boone County recorder's office. Teresa has been doing research for over 40 years. Michael Maben is Immediate Past President of the Indiana Genealogical Society. He is an Associate Librarian and Lecturer in Law at the Maurer School of Law at Indiana University. Contact information for all of the current ICGs and information about the ICG program can be found on the IGS website. - probate/will/intestate records for Frederick Kysar? - church records - membership, births, deaths? - death date for Frederick Kysar; & coroner's records, doctor's records, death notice/funeral notice/obituary- newspaper clippings? - old family bible records? - last known records: 1840 US Census (Frederick Kyser, Jennings Co, IN); land deed- dated Jan. 20, 1841; NOT listed in 1850 census, so assume he died between Jan. 20, 1841 & before 1850 census. Kysar, Kyser, Keiser, Kizer, Kiser, Keyser, Kayser, etc. I have been attempting to trace my Lennen Family lineage. I have managed to trace the following Lennen Family Line to Peter Blackford Lennen and his wife Mary Ann (Ford) Lennen. Peter was born around 1821. Some indications are that he was born in Maryland, USA. Other sources indicate Indiana as his birthplace. Mary was also born around 1821. Some sources indicate her birthplace as Maryland as well. They were married in Hamilton County, IN, around 29 March 1842. Peter died in service (Union Army) during the Civil War, on 10 February 1863, in Grand Junction, Tennessee. Mary died in March 1897, in Hamilton County, IN. Peter was buried in Corinth National Cemetery, Alcorn, MS. Mary was buried in the Woodward-Gwynn Cemetery, Hamilton County, IN. They had seven children: Benjamin (1843), Sarah (1844), Ann (1848), Martha (1851), Mary (1852), Peter B. (1855), James Madison (1859). Any information welcome. I look forward to hearing from you soon. Mary Eugenia Graves was born 1951/1952, daughter of James Graves. She married ? and had a daughter Joann Tara ? b. Dec 2 1971. Who was Mary Eugenia Graves husband? Indiana county unknown. Thanks. If you are in the Owen County area this month, this looks like an interesting session. The Indiana Genealogy Digitization Project is sponsored by IGS and awards a digitization kit for $500 to qualified Indiana non-profit groups. If your organization has genealogical materials that need to be digitized, please visit the IGS website for more details.